If you buy your pet food in bulk it can be pretty annoying knowing where to store the bulky bag, especially if you don’t have much space in your house. Also if you leave the bag lying around, the easy rip material means that your pet might just be helping themselves to a few more treats than you’re aware of. 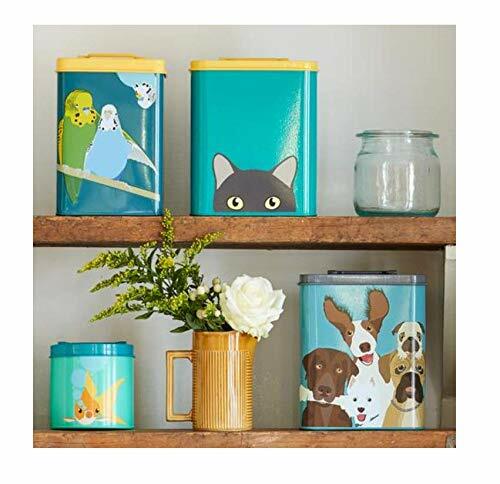 Instead of trying to jam a big bag into your cupboard these pet bins offer a neat and stylish way of storing your pet food. They keep the food fresh and are easily accessible making meal times so much easier and quicker. Also, if you have a cheeky pet that always steals food these bins will make sure that won’t happen (unless you have a really clever pet). Whatever your space or style you will be sure to find a suitable pet food bin for your home. 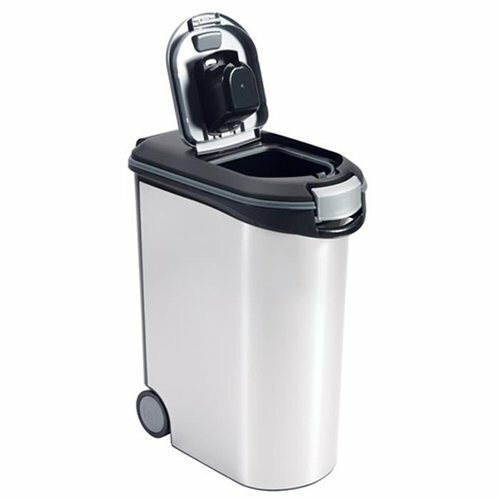 If you like things stylish and within keeping with your decor then this bin is perfect for you as it just looks like a normal bin. It keeps your pets food fresh and neatly stored so you don’t have to worry about finding a place for those bulky, easy tear pet food bags. Bring some character into your home and store your pets treats and knick-knacks with a stylish powder-coated galvanised steel treat tin. Whether you have a cat, dog, budgie, rabbit or chicken there is a funky treat tin just for you. 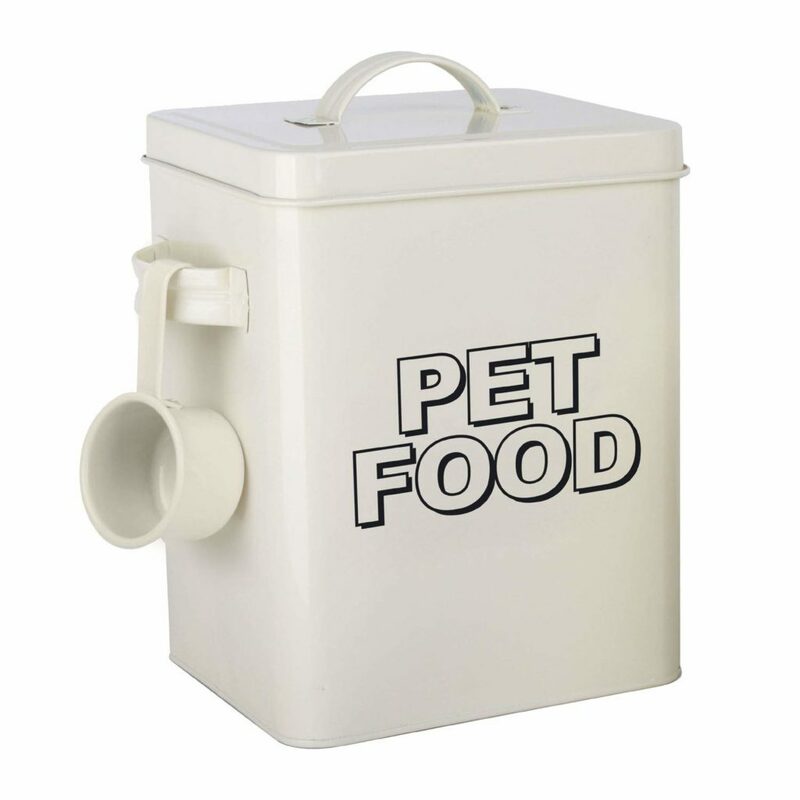 There’s no better way to store your pets food than using a storage container like this one. It comes with an integrated scoop so you can have better portion control for your pet and the rubber seal ensures the food is kept safe and fresh. 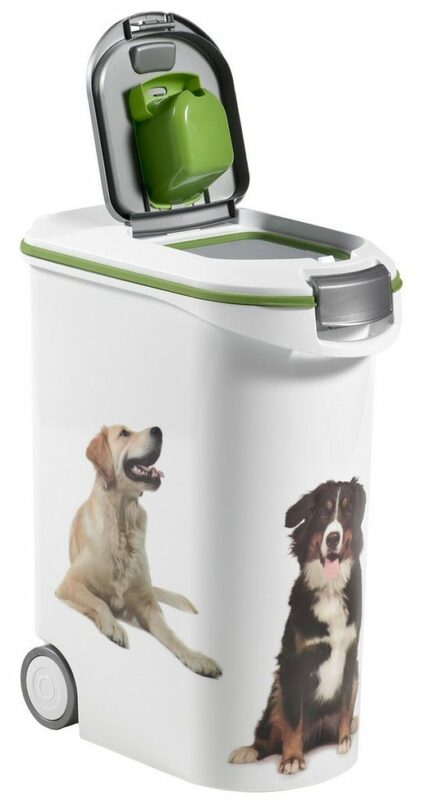 This appealing pet food bin in perfect for storing your dry pet food. 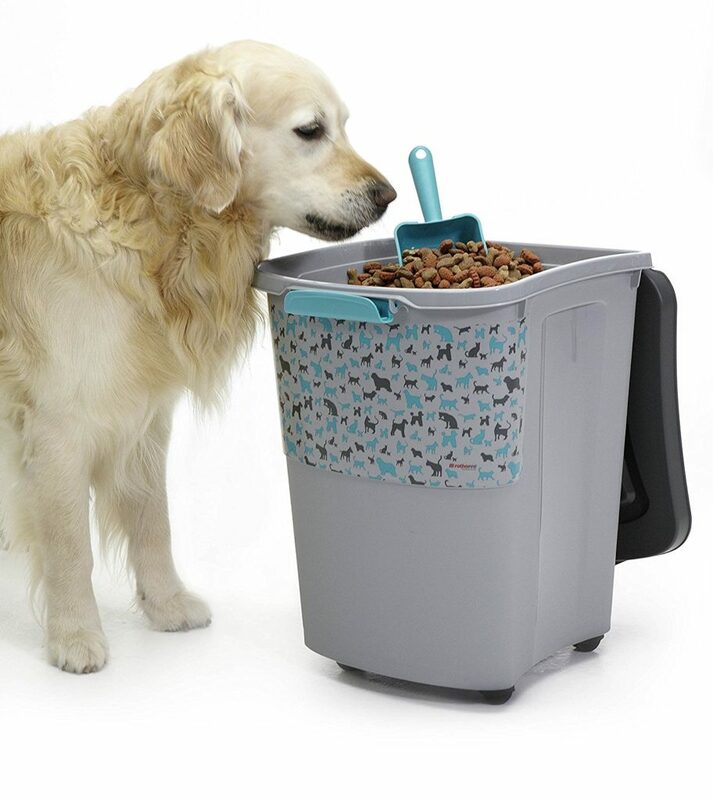 With four castors, this bin can be wheeled around with ease and the airtight lid ensures that your pet can’t get into the bin for sneaky nibbles. A scoop is also included. 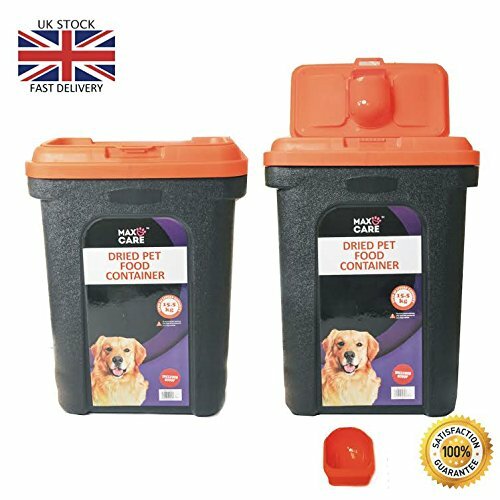 This popular pet food bin is suitable for dog, cat or even rabbit food and has great reviews, it comes in a variety of sizes from 10 litre to a 54 litre storage capacity. There is a two way lid access for daily use and refilling and a scoop is included. Cleaning couldn’t be easier as it’s durable yet lightweight. 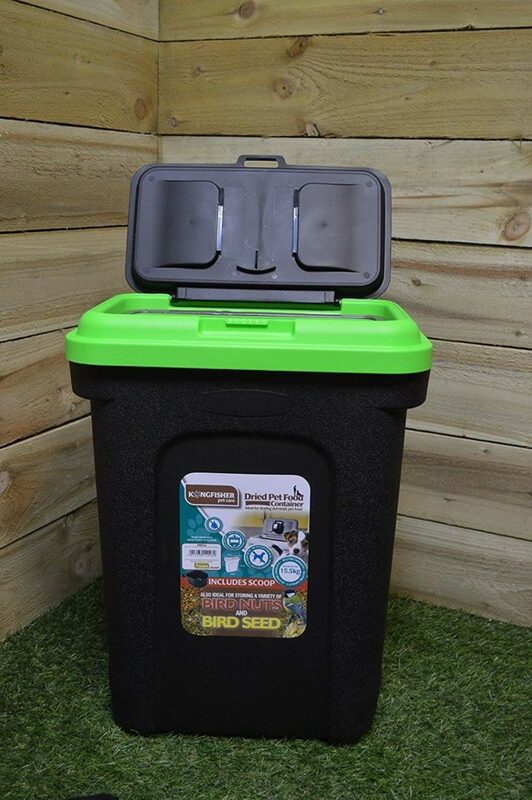 This food storage bin will fit nicely into a corner and is perfect for pet or even storing bird food. The flip top lid has a rubber seal which ensures that the food is kept fresh and it comes with a scoop to make life that little bit easier for you. This pack of 2 vintage storage tins allows you to keep both food and treats separate and fresh. The food tin comes with a scoop on the side you can be sure you are not over feeding your pooch. Whatever your decor these tins will be sure to keep in style with your home. 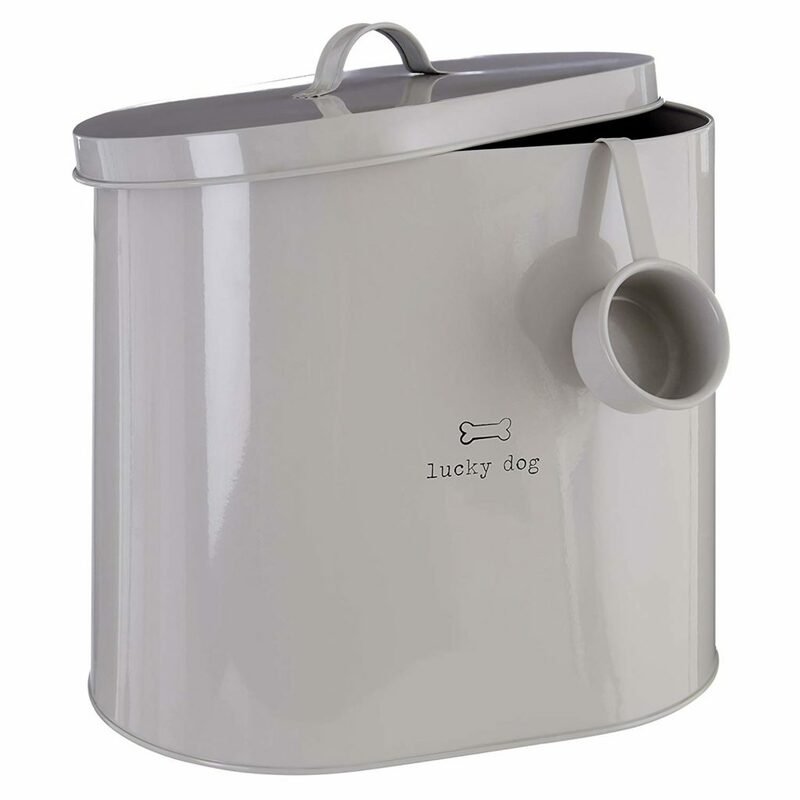 This classy 12L dog food storage tin is a great choice for keeping your dogs food fresh and out of reach. It stores neatly anywhere and also looks very stylish too. The scoop allows you to control the portions. 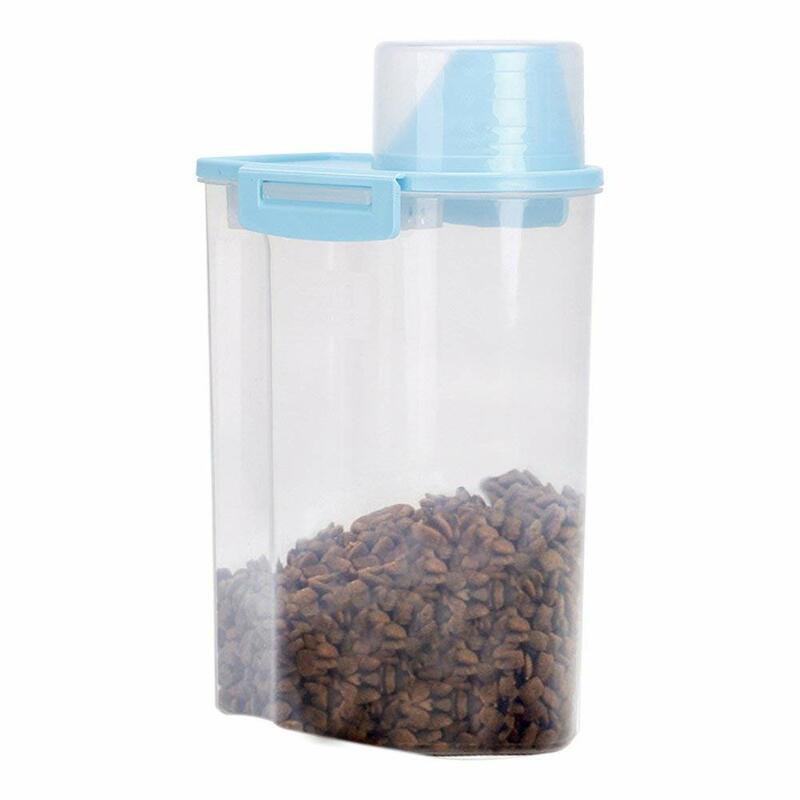 This simple food storage container has great reviews and is a great option for storing your pets food and treats. The seal buckle keeps out moisture and humidity which allows for fresher food. It’s very easy to clean and the translucent design allows you to see when you need to refill.